5. Only take surveys that are worth your time! Taking online surveys can sometimes be a process that takes longer than expected. Even though the compensation you receive for taking surveys makes it rewarding, it helps to have a few tricks up your sleeve to make taking online surveys faster. Roboform offers a free download of their form filling software which makes it handy to quickly and automatically fill out registration forms when registering with multiple survey panels, as well as answering redundant questions for actual surveys (ex. Date of birth, name, etc.) Check out Roboform here. It’s easy to stay organized if you create a separate e-mail address just for receiving online survey invitations. Use a free e-mail provider such as gmail or hotmail and have all of your surveys delivered to the same account. Not only is it easier to stay organized, but if you accidentally sign up with a survey panel that isn’t legitimate and ends up sending you spam, at least your personal e-mail account is not affected. Make sure you’re running the latest internet browser and have the latest versions of flash and java installed so that you don’t need to install anything when actually taking a survey. It also helps to have a fast internet connection! Not having to wait for pictures, sounds or videos used in the survey will also help you answer the survey faster. Some surveys have little boxes where you are asked to actually type out your opinion on a product or service. Although there’s no time limit to completing surveys, you can save yourself time by being able to type faster. If you can learn to use all of your fingers when typing and completing surveys, you’ll complete your surveys faster than someone using their two index fingers! When you start receiving multiple online survey invitations from different survey companies, you might find it helpful to start comparing the survey lengths and incentives offered for the surveys you are invited to complete. 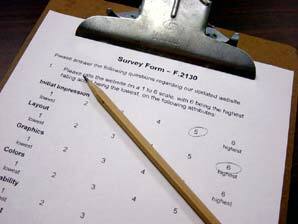 One survey may offer you, for example £2 for completing a 10 minute survey. Another company may offer you £3 for completing a 20 minute survey. It’s easy to see that you will make more money per minute by taking the £2 for 10 minute survey. Survey lengths and incentives awarded are always listed in the e-mail that lists the survey opportunity. When you are ready to cash out your survey earnings, if you have the option of choosing to be paid via PayPal or by cheque, choose PayPal. You will get your money faster this way – no waiting around for the postman! Here you can find a list of PayPal Surveys.